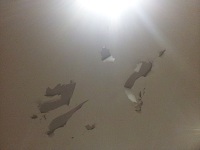 On Monday, beforehand, we'd spent about an hour back at my old place peeling and scraping the paint off the ceiling together and polyfilla-ing where the old light fittings had been in preparation to get it re-painted this week before his sister moves in this weekend. We managed to do that just fine together. So Tuesday he went to cricket and I stayed home. Honestly I think I needed a night in at this new house on my own. I actually haven't really spent any alone time there yet really. I had a lot of alone time in my old house, time to settle myself in. I moved things around, probably a few things that I shouldn't have since they were too heavy. But I was working thru my annoyance & frustration and I wasn't about to wait around for him to get home to do what needed doing. There are some things he's fantastic at getting done (take my ceiling for example, or in fact, the whole move in general) but, the little things, the random things I want done, seem to sit around waiting forever. He hasn't commented on any of the changes I made ... Mostly they were in our new outside area. Which is usually my happy place and not really somewhere he spends too much time. He probably got this out of his system by setting up the TV and sound system in the lounge :) Anyway, I felt better for it. Yesterday Gypsy got spayed. I went home early from work with a headache, took some meds, got some sleep and then collected her. She was a bit funny last night (to be expected), unusually quiet and slow. But she did eat, which made me happy :) She seems closer to normal this morning. Sweet thing. 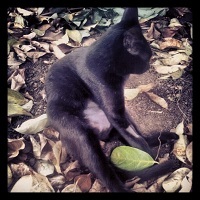 (The Trucker just Whatsapp-ed me a recording of her purring <3 ) She reminds me of a Silverback Gorilla in this photo - haha. Must've been the light thru the trees because she definitely doesn't have any sliver-grey fur. Yesterday I also had someone come in and prime the ceiling and paint. Unfortunately we didn't buy enough paint so The Trucker went to buy more after work and then went and painted on the second coat (see, he is pretty amazing, and I know I'm actually really lucky) and I went thru about an hour later with the vacuum and what not to clean up. Life is not awesome right now. Where is that light at the end of this tunnel? Oh, there were one or two highlights this week actually: First, I finally received my birthday gift from The Peeb. 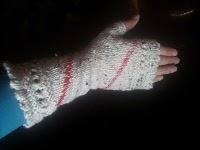 She knitted me some fingerless gloves :) They are pretty cool. The only downside is they are completely different sizes. And only one fits snugly enough to be wearable. :( Hopefully she'll re-knit me the other one because actually just last week I was thinking it may finally be time to replace my current, rather old ones, which I wear pretty much every day in winter ... fingers get cold typing on computers and moving the mouse around.